This year (turning 30) has been a life-changing one for me regarding my perspective and the way I look at life. I decided not to make resolutions this year and it's been rather freeing - that's not to say that I won't plan or have goals...I'm just not going to set out with lofty goals of "losing 30 pounds," "saving X amount of money," etc. There's nothing particularly wrong with that, I just don't want to do it this year. In the spirit of a new perspective, I am doing something rather drastic that I know quite a few people will not agree with or understand. I noticed (this year in particular) how much people's lives revolve around social media, myself included. At family gatherings, social events, parties, dinners, it seems like every story someone would tell would start with, “Did you see on Facebook…” People would pull out their phones and scroll away while only half listening to the conversations around them. Kids would obsessively ask to see other people's phones or tablets, and I watched people in public handing them over immediately to "shut them up." I watched important events - birthdays, milestones, concerts - as people ignored the actual thing taking place and instead had their phones in their face: recording, taking pictures, sharing immediately, and updating their statuses. As an experiment, I went off Facebook for a few weeks and made sure to tell people they'd have to call or text me: a few did, most did not. I had to reach out myself to most of them. Someone even angrily told me, "How am I supposed to invite you to things when you're not on Facebook?!" I don't say these things to accuse anyone because I'm guilty of some of the same things too. I have been waking up of a morning for months now and automatically grabbing my phone to scroll through my Facebook newsfeed for 15, 20 minutes, sometimes even half an hour...and honestly there's not anything on there that couldn't wait. I also love sharing what we're doing, what the kids are up to, etc. This isn't to say that social media can't be used well and kept in check - but where is that line? How much is too much? How much do we need to be sharing? How does it affect others? 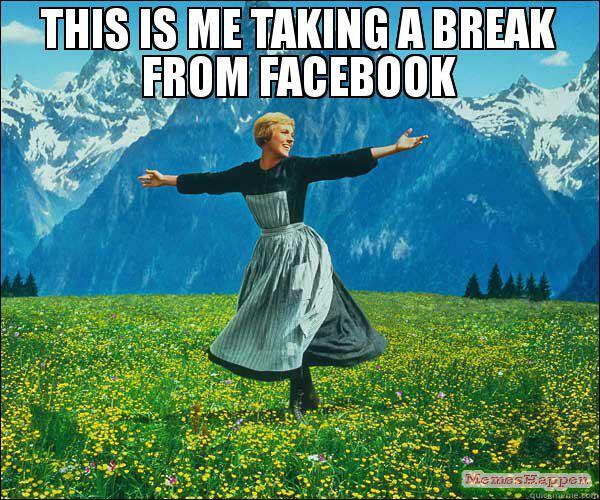 I guess Facebook is mainly the thing that is bothering me because that's where I see the most arguments, drama, fighting, over-sharing, and angry diatribes. The recent political season proved difficult. Social media gives some people a feeling of freedom to say whatever they want, without consequence or thought of what might happen, who might be affected, etc. I saw this especially on Facebook - people arguing, name calling, and deleting other people (even family members) because of who they were voting for or because of their ideas. There was no “agree to disagree” or “let's not discuss politics/religion” - instead it was inflammatory comments, angry rants, bitter diatribes, and awkward family dinners or conversations in public. And it's not just politics - yesterday I watched an argument starting in a comments section of a friend's page between herself, her close friends, and her family members. It just kept escalating. Is that how we want to spend our time each day? Delving into minimalism this year also helped me to realize how much time I've been wasting on many different things - one being my phone: not getting out of bed when I need to, doing trivial things, reading stuff that wasn't all that important, and missing out on real life moments. So with all that in mind, I'm getting rid of social media for a year. Mostly. My blog is setup to automatically post links to new posts on my Twitter & Facebook page accounts - I will be leaving that as is. I also won't be deleting or deactivating the accounts. I'll be deleting the apps from my phone save one. I have one group on Facebook in particular that I have to check into weekly so I will have to leave my account open so I can do that - so instead I'll be using the groups app to do only that. I'll change the main images on my personal FB account to let people know I'm gone. The only social things I plan on still using are writing in my blog and sharing photos on Instagram - I love writing & sharing photos, those two platforms are drama-free, and I don't spend an excessive amount of time on them...so I'm keeping them as is. So what do you think - am I crazy? Probably. I'll update on here from time to time on how things are going.